Incremental changes can reap big rewards. Ask any gardener using a shovel. 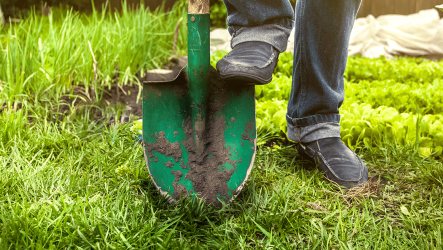 The shovel is itself a handy tool, but consider how much easier to use and more efficient it became when the ledge was added to the top of the spade. Hand digging became faster, more forceful and less prone to fatigue just by adding a more comfortable place to push. So it is with many of our scientific tools. Systems Biology Theme leader John Yin and former lab members Jay Warrick and Stephen Lindsay were recently awarded U.S. Patent No. 8,945,486 B2 for improvements to a microwell device. Microwell devices are fairly common tools in biological lab settings but the modifications that these researchers created were worthy of WARF’s attention and significant enough to push their science forward much like that ledge on the shovel. We caught up with Jay Warrick, now a postdoc in the Beebe Lab, to understand what they created and the process to have it patented. The Yin Lab studies the Vesicular stomatitis virus (VSV). It is a simple virus that contains only five genes, which makes it ideal for modeling how it produces more virus. Warrick came to the lab with a background in physics and mechanical engineering and after a stint at General Motors. His biomedical engineering thesis work under David Beebe, an expert in microscale tools, involved surface tension and passive pumping. Passive pumping is the principle that small droplets, which have a small radius and therefore high internal pressure, could pump their contents to larger droplets, which in turn have a larger radius and therefore lower internal pressure. This study of water droplets and surface tension turned out to be an ideal fit for improving the types of experiments the Yin Lab was performing. Lindsay had been working on quantifying single cell fluorescence but had a problem putting the cells on a traditional culture. When infections occurred, it became very hard to keep track of a single cell, as the cells were dying and crawling over one another. There was so much prep work and handling that although the method was accurate, it yielded very few data points. The challenge was how to increase the throughput. Warrick and Lindsay felt that using microwells would be a good option. As Warrick explained, “instead of pipetting fluid into each well you would literally pour fluid over all the wells so stuff falls in. Your cells fall in there, your viruses diffuse in there and then you seal it with a lid; that separates each well. 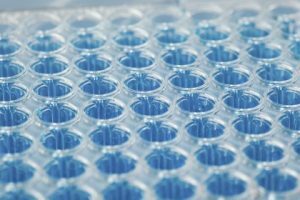 By doing this we can shrink everything down to the scale of a cell and we can do thousands of these experiments in under a few drops.” Microwells provide a location where the cells are trapped – they fall into the wells and are unable to climb out. As the infection ensues it is easier to track individual cells as they are prevented from crawling over one another. It saves time, energy and materials while giving the research team the amount of data points they needed to gain insights into the heterogeneity of the interactions. Unfortunately, working with a standard microwell can be messy. “Especially when you’re working with a virus you don’t want things to get messy. We wanted to be able to work with very manageable droplets,” Warrick acknowledged. Armed with his background in passive pumps, he decided to leverage surface tension: a droplet beads up and defines a region on the microwell array. That’s the source of the invention. To help define the region of that droplet, a moat of air was built in to the microwell so the droplet expands until it reaches the end of the moat but goes no further because of surface tension. The new design defined regions that allowed Lindsay to do the protocols more robustly with less mess using a standard pipette. He was able to do multiple experiments on a single array. Instead of pouring a single fluid on top of the entire array, diverse solutions could be used on the same array but localized to different regions. That moat of air was the ledge of the shovel and the answer to their data point problem. Warrick said you never know what could be patentable or licensable but that’s the beauty of having WARF available to our researchers. According to Warrick, “They ask you what was the thing that solved the problem that you were running into? Whatever it was, let’s talk about that.” His pitch to WARF was that by adding the moat of air, researchers could address the enhanced microwells not only using a hand pipette but now also using liquid handling automation and high throughput screening applications where robots move pipettes. After the initial screening approval and six months of back and forth with WARF’s patent attorneys to standardize the language of the proposal, it took over a year to hear back from the U.S. Patent Office. 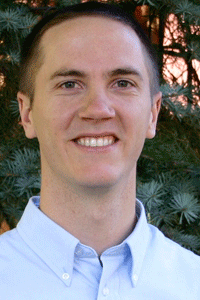 In the interim, Lindsay earned his Ph.D. and is currently a research scientist at Kimberly-Clark. Warrick moved back to the Beebe Lab and is still working with the microwells, this time studying prostate cancer and multiple myeloma. He foresees future uses of this technology for single cell PCR (Polymerase chain reaction) and single cell secretion assays. Eventually he thinks it could be used as a unique assay that would provide a clinical readout on patient samples to determine responses to a therapy.